In 1561, Baldesar Castiglione — a diplomat and what used to be called a “man of letters” –finished writing a book that was an homage to his time at the court of the Duke of Urbino. His aim was to put down in a philosophical discussion that which makes the perfect courtier and the perfect Court Lady. Castiglione lived during the Italian Renaissance when the cultivation of the self and the pursuit of beauty was encouraged. Like “learning for learning’s sake” those sorts of pursuits have become code for “self-absorption.” Or worse. In our competitive society, he who dies with the most toys, wins. It is my firm belief that most people attend college in order to “get a better job.” Read: make more money. There is nothing wrong with that goal, but institutes of higher education should be more than just trade schools. The cultivation of courtliness remains a worthy pursuit for those who would be more elegant. Harold Acton, one of the class of aesthetes who captured the public’s imagination between the wars, left England during the 1930’s to become, in effect, a bridge between the hedonistic wisdom of the East and that of the West. In “Children of the Sun” Martin Green recounts that he was somewhat successful in this and did achieve a new level of courtliness, amiability and scholarliness. But what do we mean by courtliness“>courtliness? A certain refinement, surely. We must also do away with the obsequious part of the definition… at least for our purposes. When I think of what it means to be courtly, a couple of thoughts pop to mind. Foremost among them is “restraint.” I am the first to admit that I can blow my stack pretty quickly given the right combination of circumstances. When I think of the elegant person, I think of someone who is unruffled, who sort of glides over most stumbling blocks. Unflappable is the word that springs to mind. Peyton Manning will be described that way this weekend. All well and good, you say, but how am I supposed to cultivate that kind of composure even without having to contend with 250 pound defensive linemen? Begin with regular and vigorous exercise. While it sounds counter intuitive, regular exercise will lower your blood pressure. Recognize that a quick wit, a quick reply, and a quick mind are not always one and the same. Take a moment to consider your answer or comment and make your devastating reply at the appropriate moment. I also find that pasting a bemused smile on my face most of the time works wonders for my outlook. Watch any Cary Grant movie and you will see him actively listening to his co-stars, not just for cues, but in order to ad-lib and be engaged in the script. His is not the bemused detachment of some actors. He’s quietly enjoying himself and not upstaging anyone. Finally, to paraphrase the bumper sticker, visualize inner peace. Acton learned this trick in China. We must do so in an increasingly electronically fractured world where every device, platform and network cries out for our immediate attention. Every once in awhile, unplug, “tune out.” Do nothing but read a good book in silence. Lie on the sofa and listen to music. Or take a walk with no planned destination or agenda. Breathe deeply. It’s a good start anyway. This entry was posted in Cultivating and tagged Baldesar Castiglione, Cary Grant, Children of the Sun, Duke of Urbino, Harold Acton, Peyton Manning, The Book of the Courtier. Bookmark the permalink. Very wise words ( I am working on all of these) and such an interesting profile of Castiglione. Ah, sprezzatura! Could this be the origin of the word “urbane?” Great post. Tessa Scoffs, I’m not sure. It would be a fitting tribute. toad, found that bit, but I’m wondering about the film. I’ll poke around more in depth on the site. Thanks! What a wonderful post! A difficult read, but if one is motivated, it has tremendous insight. Castiglione’s treatise is a must read for the cosmopolitan jet set… or if you just like traveling and meeting new people (without killing them, of course). Sort of international guide book on how to be unique and fit in at the same time around the world. At least, that’s how I see it. 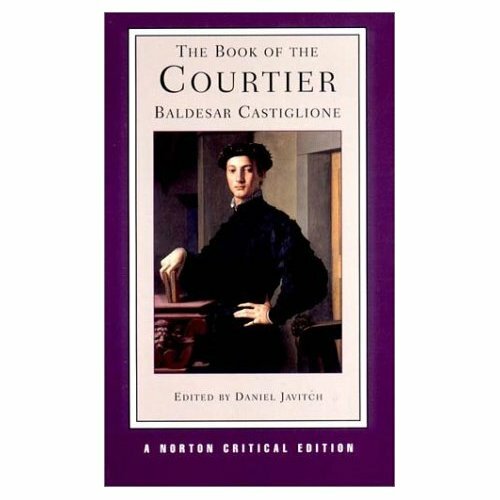 Castiglione’s The Book of Courtier is such a good read. The studiolo at Urbino is one of the most beautiful rooms I’ve ever seen! I am also reminded of the wonderful writings of Lord Chesterfield to his son in terms of direction on how to live elegantly and gracefully. A gentleman is foremost a gentle man, whether his suit is bespoke or he wears crumpled khakis. When thinking of Cary Grant or Beau Brummel, we look to role models who were self deprecating and cultivated discretion. There was nothing that shouted, “Look at me,” and there was nothing vulgar or brash. Calmness, refinement, sensitivity to others are all elegant attributes we should aspire to as much as well fitted suits and the right amount of shirt cuff showing. Any suggestions for current role models? The most recent ones I can think of are Anderson Cooper and John Kennedy Jr. But there have to be, there have to be some new upcomings. Where are they? SwF, I am unfamiliar with the Chesterfield opus. What’s the title? A well thought out comment! May I use it in my book? Full attribution of course. I’m not sure I know who the “upcomings” are. Most use stylists and that is dangerous as they are fashion conscious. I might add Matt Lauer. He chooses his own clothing (he sold menswear although he is colourblind) and is a fan of Canali as far as I can tell. This may be fodder for a post.